Acche Din Aane Wale Hain? Results of Indian General Election 2014 yesterday gave a new national leader to the country in the form of Mr. Narender Modi. His rise is a case study for marketing and advertising people. He was present everywhere during election campaign whether it is news channels,newspapers,facebook,twitter,T-shirts,tea cups,Modi comics, chai pe charcha,3D rallies,etc which helped him reach maximum number of people and making an impact in their minds which other political parties failed to do. His mannerism and controversial behavior also helped him gain popularity. Emergence of Narender Modi also helped people rise above caste politics which destroyed political presence of regional parties eliminating possibilities of their role as king or kingmaker as in last twenty-five years. These parties formed due to regional aspirations of each became mere pressure groups in coalition governments restricting governments to take any strong steps. Women reservation bill,Janlokpal bill, food security bill, targeted violence bill are some important bills and acts which remain hanging between the two houses of the parliament thanks to these regional parties. We know some parts of the country needs more attention than the others - the main demand of the regional parties however they failed to do so when came to power in their areas barring the few. Question mark at the end of my title shows my doubt about good days since India of 1.25 billion population is entirely different from a wealthy Gujarat state of 60 million people. 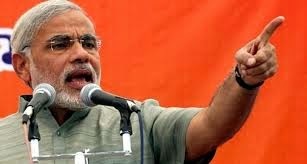 Also there must be some expectations of RSS (Rashtriya Swayamsevak Sangh ) parent organisation of BJP(Bhartiya Janata Party ) who devoted all his powers in promoting PM Modi and of those people who have spent enormous amount of money in his public rallies and meetings, how he handle this would also be interesting. Moreover a large population is feeling insecure under his leadership, to inculcate faith in them would be a daunting task. Congratulations and best of luck to him for the future only time will tell how positive or negative will be MODI-fication of politics. Linking to Wednesday Prompt 2014 #15 by Write Tribe. Interesting perspective. I high disagree with extremist orgs such as RSS and Modi is such a polarizing figure of Indian Politics. But, agree he pursued an aggressive social media campaign that turned out to be the winner during this elections. Let's hope and fingers crossed.